Is it a cold or is it the flu? Should you get a flu shot? These are important questions for all of us at this time of year. According to the Centers for Disease Control (CDC), the flu, or influenza is a serious disease that can lead to hospitalization and sometimes even death. Every flu season is different, and influenza infection can affect people differently. Even healthy people can get very sick from the flu and spread it to others. Over a period of 31 seasons between 1976 and 2007, estimates of flu-associated deaths in the United States range from a low of about 3,000 to a high of about 49,000 people. During a regular flu season, about 90 percent of deaths occur in people 65 years and older. The “seasonal flu season” in the United States can begin as early as October and last as late as May. Not every sniffle is a sign of the flu. Flu shots do not protect against the common cold so even those vaccinated are subject to seasonal colds. Many people are confused about the differences between the cold and flu. While both are caused by viruses, their effects on the body can be substantially different. Cold viruses are generally less serious than those that cause influenza, or the flu. Cold viruses tend to affect the nose, sinuses and throat, while the flu often affects the entire respiratory system including the bronchial tubes and lungs. According to The National Institute of Allergy and Infectious Diseases, the flu usually produces a fever that can persist for several days. Colds rarely result in fevers. Severe body aches, pains and exhaustion are characteristic of the flu, but are much less severe in cases of cold. Sneezing and coughing are common to both, with persistent sinus irritation being more problematic for the cold sufferer. Coughs due to colds are associated with throat irritations, while flu coughs are often brought on by bronchial infections. Lung infections are not typical of colds, but are of major concern in influenza. Lung infections can lead to pneumonia, the major life threatening complication of the flu. 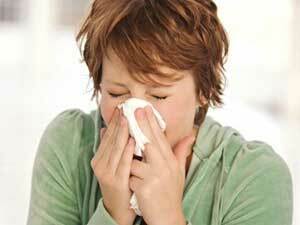 People with weakened immune systems are most vulnerable to both colds and flu. This would include HIV infected persons, the elderly, young children and people with serious chronic diseases. Symptoms requiring professional care include difficulty breathing, vomiting, fever beyond 3-4 days and persistent coughing, especially if yellow or green mucus is present. Each year flu vaccines are made available and people with weakened immune systems should consider them. There is no cure for the common cold. Those in good physical shape can strengthen their natural immune systems by eating healthy and engaging in regular exercise. Vitamin and mineral supplements can also help strengthen natural immunity. Some experts say that extra doses of vitamin C, the herb ecchinacea, and zinc, both orally and nasally, can shorten the duration of colds significantly. They must be taken at the first sign of illness to be effective. It is important to hydrate the body when sick with either a cold or the flu. Drink plenty of water and juice. Green tea is a good source of antioxidants, and an occasional cup may also prove helpful. Low grade fevers are helpful in killing the virus and guarding against secondary bacterial infections. Therefore, fevers should be allowed to occur without interference. Traditional antibiotics are not recommended as they have no medicinal value against the viruses that are responsible for colds and flu.